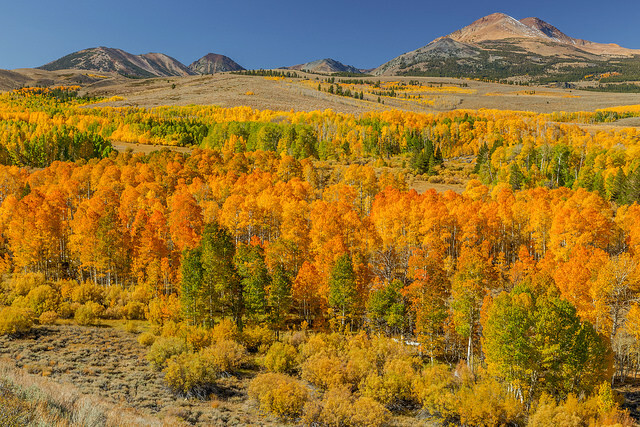 Art of Transit, sort of: Fall colors earlier this month along U.S. 395 near Conway Summit. Photo by Fred Moore, via Flickr creative commons. Non-hysterical and straight-up coverage of yesterday’s very unusual incident in which a bus passenger wearing a mask said he had ebola and then exited the bus. “Los Angeles County Department of Public Health officials don’t believe the rider has Ebola and believe the incident was a hoax, spokeswoman Sarah Kissell Garrett said,” reports the Times. Ebola is not spread through the air or by water, or in general, by food. However, in Africa, Ebola may be spread as a result of handling bushmeat (wild animals hunted for food) and contact with infected bats. There is no evidence that mosquitos or other insects can transmit Ebola virus. Only mammals (for example, humans, bats, monkeys, and apes) have shown the ability to become infected with and spread Ebola virus. The CDC has plenty of information on Ebola on its website. Obviously it is not a disease to be taken lightly but it’s also important to understand the facts. A brief article and podcast covers some well-trod but interesting ground: the many transit plans that burped forth in our region over the year, some of which were permanently shelved and some of which eventually were built and are busy today — i.e, the Red Line, Blue Line and Orange Line. My three cents: when you hear about a transit project, a good first question usually is: “and how will you pay for it?” If there isn’t a solid answer, be leery. Interesting story about possible plans for a rail tunnel abandoned in the early 1990s that runs under Broad Street in downtown Philadelphia. Several bus rapid transit alternatives are under study. Bike sharing kicks off with about 50 stations across the Emerald City. “The Seattle program is the first in the U.S. that includes helmet use as part of the rental. Annual memberships for the bike share program range from $85 to $125. The first half hour of usage is free and there is a charge beyond that for use of the bike,” reports the PI. I’ve been in Cincy for the past 10 days or so (helping the parents) and was pleasantly surprised to see bike share has also landed in the Queen City with some colorful Red bikes. Of course, Metro is working on a bike share program for Los Angeles County and is currently trying to finalize station locations for phase 1 of the program in downtown Los Angeles, Long Beach, Pasadena and Santa Monica. See this recent Source post. Christopher Herwig used a Kickstarter campaign to fund a photography book on these unlikely bus stops. He traveled thousands of kilometers and spent 12 years assembling this impressive collection of photos. was delivered sunday to Metro? I emailed you some as well. We had some pics of the cars at the Palmdale facility recently. We’ll have more soon. I’m not sure what you’re asking. Please re-phrase! I’m having difficulty finding a map of where Philadelphia’s “City Branch” tunnel begins and ends, but from what I can find, I gather that it runs under Pennsylvania Avenue, and is entirely west of Broad Street. The only tunnels I’m aware of that “run under Broad Street” would be the four-track Broad Street (or “Orange Line”) Subway. While a number of stations on that line have been abandoned, the last time I was in Philadelphia (roughly a year ago), it was still quite active. The longer tunnel is under Pennsylvania Ave (somewhat ironic for a Reading Railroad line), though there’s a shorter tunnel crossing under Broad St (perpendicular to it). The alignment goes in a northwest-southeast direction parallel to Pennsylvania Ave, entering a tunnel from 27th to Hamilton (just east of 22nd); it then turns east and runs in an open ditch until 16th, enters another tunnel for 2 blocks, crosses under Broad St (and above the Broad St subway), then surfaces as an elevated structure east of Broad, crossing over 13th and 12th and turning south to join the Reading viaduct on the way to the old Reading Terminal. Figured it had to be something like that. The Broad Street Subway is remarkably deep, especially given that, as I recall, it was all cut-and-cover. Not that mechanical moles had been invented at the time. There are station mezzanines under Broad Street that you could hold a Star Trek convention in. The Broad Street Subway wasn’t built until the 1920s (it started service in 1928), so it makes sense that it would be built deeper. What’s more surprising is that other portions of the Broad Street Subway were also built deep, so in the 1980s both the Center City Commuter Connection (SEPTA rail tunnel) and the Vine Street Expressway (I-676) would find space above it. re: What would L.A. look like if 100-year-old transit plans come true? It needs to be pointed out to the unwary that no “subway to the sea” was proposed for construction in the Kelker – De Leuw rapid transit plan of 1925. The only rapid transit lines being proposed for construction were the SOLID RED LINES on the map. The dotted lines were NOT “for immediate construction”. The dotted lines were for “future construction” as listed in the legend at the bottom left corner of the map. When was this “future construction” to occur? No time frame is given. Buyer beware, no “subway to the sea” was proposed for construction in 1925. Strip away all the dotted lines and leave the solid lines, and you see a much more modest and very Downtown-centric Rapid Transit Plan. At the end of the day, minus all the smoke and mirrors, a plan to get the P.E. trains off of the city streets and at-grade rights of way in the City of Los Angeles and on their own grade separated rapid transit lines. Metro should consider extending the Red line under the Orange line to Woodland Hills and extending the Red Line to Burbank Airport too. Can the Valley support the Orange Line and Red Line from North Hollywood to Woodland Hills? Probably not, but it can certainly support (and be better served by) the Red Line INSTEAD OF the Orange Line. Just as LAX/LAUPT runs can certainly support (and be better served by) a single-seat rail connection than by the Flyaway Bus.